The greenest house is the one already built, runs the eco-friendly adage, but should that also include brand new buildings constructed from pre-used materials? This double-height living, kitchen and rumpus space addition in the form of a traditional barn is an excellent case in point. 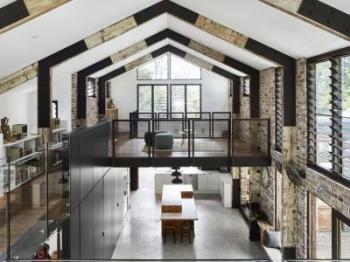 Designed by architect Rebecca Caldwell of Maytree Studios, the extension's structure and skin is built from recycled materials. 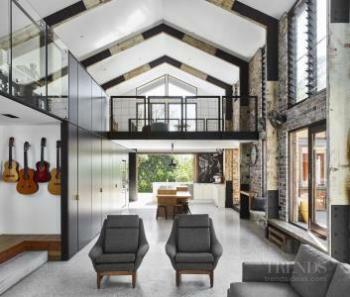 "The rugged portal frame with expressed steel connections and the second hand bricks also resulted in a semi-industrial aesthetic on the interior," says Caldwell. 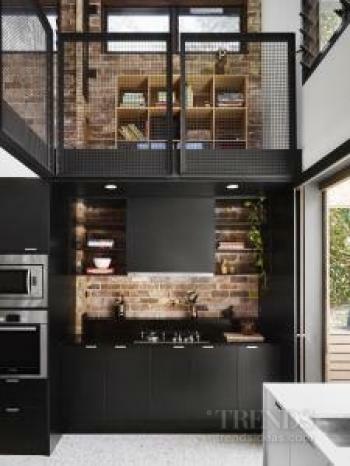 "And we looked to extend this semi-industrial feel to the kitchen where the brick wall becomes the splashback and the tall wall cabinets are in matt black." 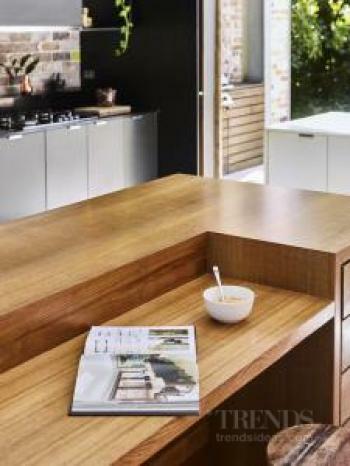 The furniture-look island also extends the recycled aspect of the design, being built by the homeowner from salvaged Tasmanian oak. This is used as a breakfast bar and casual dining area. "In terms of functionality, the kitchen doubles as a through space, hence the understated, furniture-like appeal of the island. We created wide avenues between various areas of the kitchen so someone could be cooking and another passing easily through the space at the same time." 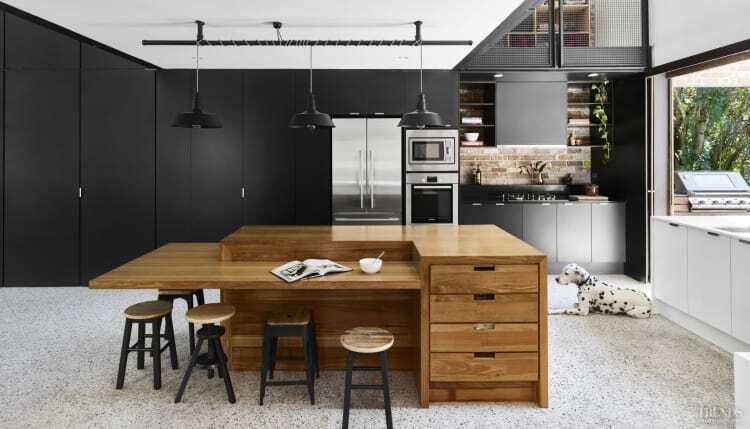 The kitchen is designed in zones and, despite the wide spaces, achieves a close work triangle. "The tall cabinets near the island concertina open to reveal a large pantry, with provision for small appliances, while the cooking station is to the right. Both areas are a few steps from the island and the low L-shaped run of cabinetry on the other side of the space, used for prepping and clean-up as well as additional storage." The crowning touch on the design, literally, is the mezzanine floor, which is centred directly over the workspace and helps give definition to the kitchen area.